This isn’t what you were thinking you naughty reader! This is much much more decadent! 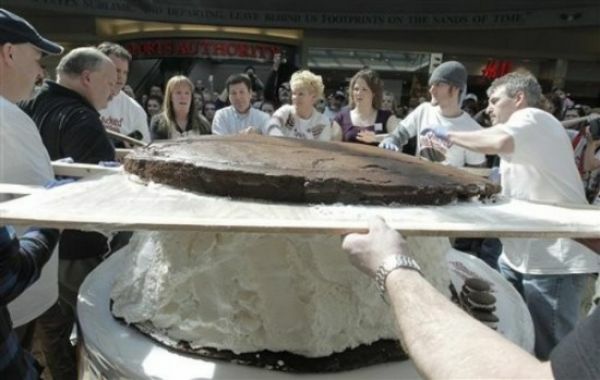 Wicked Whoopies a company that creates those yummy whoopee pies began to create a gigantic pie that weighed in at over 1062 pounds. 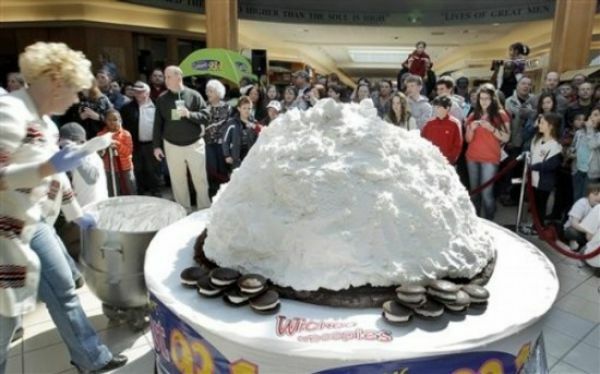 The record holder prior to this huge whipped cream delight was 250 lbs. They created the treat in front of hundreds of people who waited, watched, and of course wanted a bite out of the newly created gigantic goodie. They were offered a bite for a small donation that goes to help pay for shipping costs to send the Wicked Whoopie pie to troops serving abroad. Learn Something Fun: The Whoopie pie or AKA the gob, black-and-white, bob, or "BFO" for Big Fat Oreo, is an American baked good that may be considered either a cookie, pie, or cake. It is made of two round mound-shaped pieces of chocolate cake with a sweet, creamy filling or frosting sandwiched between them. Oreo´s!! I could make one hell of a cookie shake with that one!